Though it's not necessary to buy a commercial exam simulator but that is probably the best-spent money. You get a lot of value for your money. You not only learn your mistakes but the comprehensive explanations given by these simulators also help you to correct them. Since many of my readers have requested about which is the best exam simulator to buy for OCAJP7 or OCAJP8? or, which one is the cheapest exam simulator but good quality, I decided to jot down some of the good quality exam simulators for Oracle's Java certification. Here is my list of some of the best Java Exam simulators currently available in the market. The list is solely based on whatever I have read and known from the people who have used it but I have not taken all the exam simulators personally. My personal experience is only with Whizlabs, which I think is more than sufficient for any candidates who wants to achieve more than 80% in OCAJP or OCPJP, but I have listed down other commercial mock exam providers to provide a comprehensive list of exam simulators. Most of the exam providers not only provides simulators for OCAJP and OCPJP but also for more advanced Java exams like OCEJWCD (Oracle Certified Expert Java Web Component Developer) and OCMJEA (Oracle Certfified Master Java Enterprise Architect). So, no matter, which exam you are preparing, you will find some good exam simulators with these providers. This is the best exam simulator for Java certification. I have used it personally so I can vouch for the quality of Whizlabs. It has separate practice tests for OCAJP and OCPJP both Java 7 and 8 depending on which version you are preparing. The OCPJP7 exam simulator contains over 700 questions and 5 full-length mock exams, which costs around 80$, you might get some discount as well. You can take the test online from any device and it also provides detailed reports on your strong and weak areas. This is anothe great Java exam simulator but only avaialbe for Java 8 i.e. 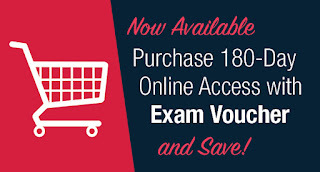 only for both 1Z0-808 and 1z0-809 exam. They also have a Java 1Z0-808 and 1Z0-809 Free Test which is created to demonstrate all the features of our Java8 Associate Web Simulator. You will be able to access 25 complete questions and will have 53 minutes to finish the test. If you want you can also download their free 1Z0-808 an 1Z0-808 dumps in PDF format for reference. If you want to go for cheap and best than nothing beats Entuware. 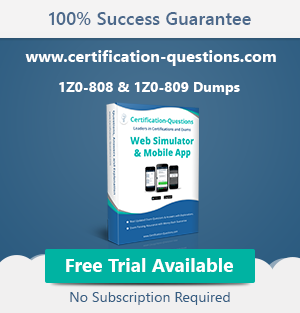 It contains around $9.95 for question bank with around 500 questions. Surely, you can't get cheaper than this. The questions are also top quality, pretty much same level as Whizlabs and detailed answer is also of good quality and explains why correct answers are correct and why wrong answers are incorrect. Kaplan SelfTest is authorized by Oracle so you can be sure that it covers the exam objectives well. The Kaplan SelfTest contains over 170 questions and the price starts from $69 for 30 days online access. The CD costs you around $99. The Kaplan 1X0-804 Practice Test for Java SE 7 Programmer II (OCPJP7) also includes 275 complimentary flash cards and comprehensive score report helps you focus your study efforts. Transcender is similar to Kaplan and also an Oracle authorized practice exam providers. They have different packs for different time duration e.g. 190 questions, price starts from $109. You should only buy either Kaplan or Transcender becuase they actually contain same question, only thing which is different is numbe of topics covered and number of questions provided. They are actually now merged together and known as Transcender, powered by Kaplan IT Training. This is another good Oracle and Java Exam simulator provider which offers training courses and exam simulators for almost all Java certifications. You can buy OCPJP 7 online training, OCPJP 7 study guide + mock exam questions from this provider for your practice. They also have free tests on their website so that you evaluate their content before you buy, woth trying to check your knowledge as well. You can also find a couple of mock exams when you buy Java Certification Study guide. The Study guide are very good resource to prepare for exam becuase they provide full coverage of syllabus and prepare you for exam by presenting concepts which are more important from exam point of view. Here are a couple of good Java study guides for both OCAJP and OCPJP, for both Java SE 7 and Java SE 8. Apart fom these, there are a couple of other books and study guides, depending upon whether you are preparing for OCAJP7, OCPJP7, OCAPJP8, or OCPJP8. You can check out my recommended books for these exams in this blog, here. That's all about the list of some of the best Java commercial exam simulators for OCAJP and OCPJP exams. 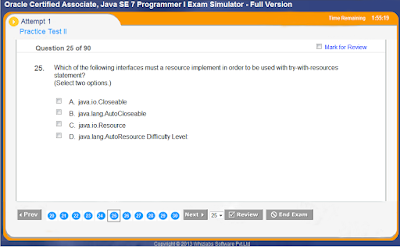 Most of these Java exam simulators provider also provides mock exams for other Java certifications e.g. OCPJWCD or OCMJCEA and other exams. There are also a lot of free mock exams available for both OCAJP7 and OCPJP8, which you can take a look before buying any Java exam simulators. You can use them to judge the quality of full exams which you will get when you buy them e.g. Whizlabs or Enthuware.